For today's post, I've returned to a favourite subject of mine. 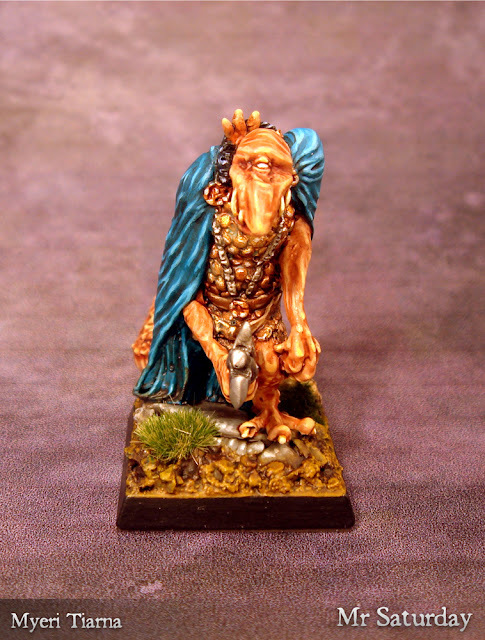 This handsome fellow is a Myeri Tiarna by Geoff Sims, from the forthcoming Myeri Clan box for The Woods: Legends of Shandisholm (due out August, it looks like it's going to be a beautiful book). 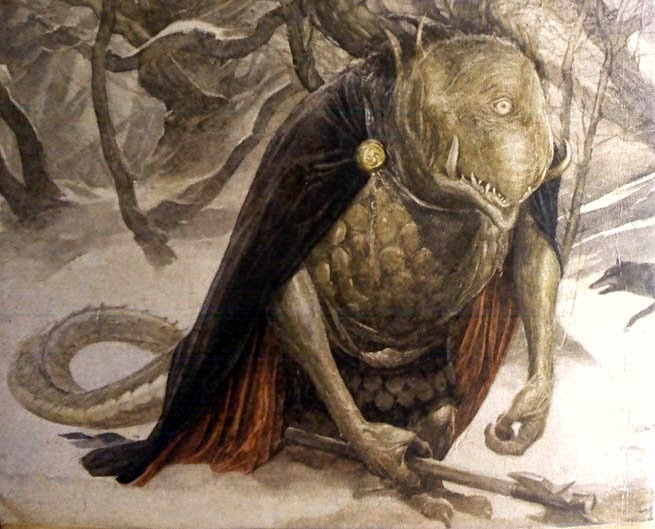 He's armed with a Snaghyrn and based on Alan Lee's Fomorian painting. You can find Oakbound here, and their Facebook page here. Anyone who has any interest in the Fimir or Celtic fantasy should really check it out. The background of the Myeri is fascintating, and anyone who loves the fimir will love this as dearly. The original Alan Lee painting. The Alan Lee Fomorian is somewhat chubbier than the Tiarna, and the colour scheme is quite different, as I've painted him to match my own clan. It's very nice to have a model based on this painting, the great grand-daddy of them all. In my own clan this fellow will be Murdach, a noble of the Fir Domhan. Having a more human size noble gives me someone to lead my fimm, and as they are due to go raiding in about a fortnight, he couldn't arrive at a more opportune time. I painted his cloak Hawk Turquoise to match the other high ranking fimir in the army, and added some freehand detail along the bottom to increase his bling yet further. His bronze has had some verdigris added. He might be a noble, but he still lives in a bog. The internet is a funny old place. A lot of the internet is like a sneaky bowl of chocolate cereal. Briefly tasty, but then the guilt. The sugary guilt. Still more of it is like walking down an alley in Bangkok at 2am singing 'What shall I do with all this money' at the top of your lungs. Now and again though it does yield gold. 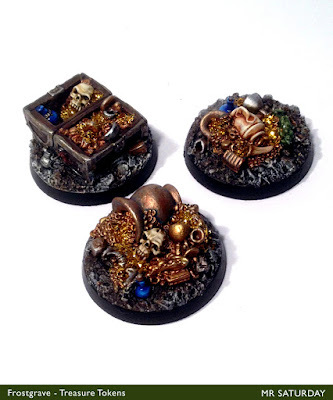 The gold in this case is the way our hobby has connected the thousands of small metal and plastic man enthusiasts together. We all know how good the interwebs is for gaming, so I'll skip right on past that. What I mean is the friendships that can result from such shared obsessions over the net. The kind where a grown man you've never met before gives you a ten second bearhug, and you're totally reciprocating. A deathworld never looked so beautiful. That's what brought about the meet-up at KnaveCon 7. 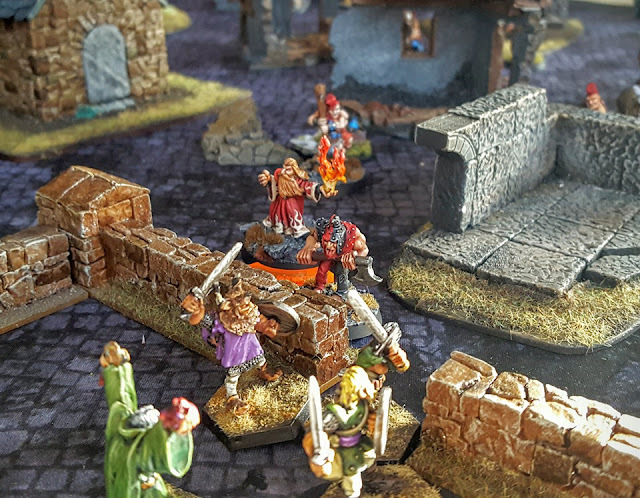 The Frostgrave portion of the day was reported on here by Cheetor over at Sho3box and here by Asslessman at Leadplague. The height of Rogue Trader fashion saunters through the jungle. So my take on the day will be more about the participants than the gaming, as enjoyable as that was. 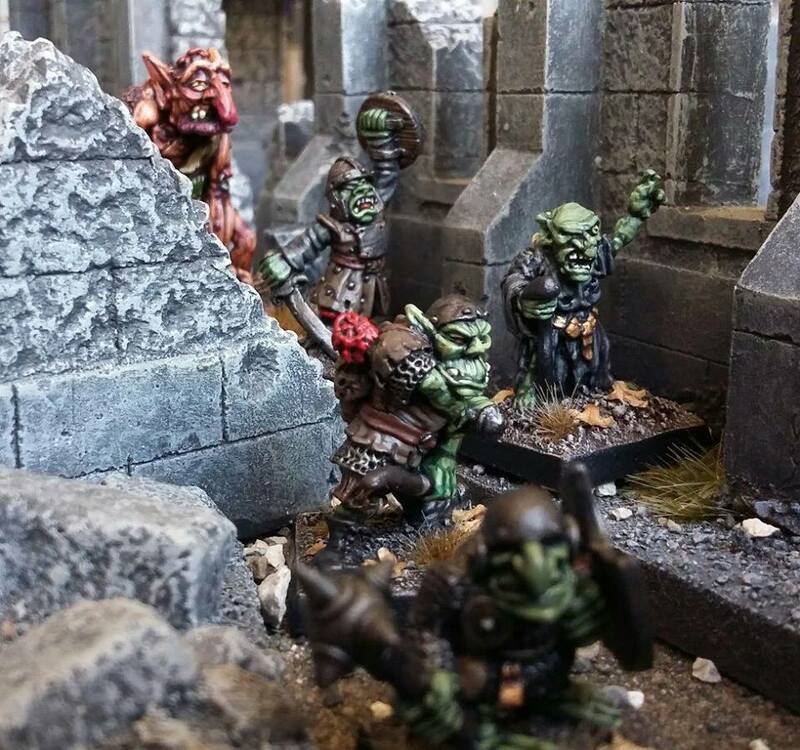 Over the last couple of years the Wipster group has coalesced out of the Oldhammer scene. What started out as trades and comments on forums and posts turned into a gaggle of miniature nuts who constantly rant and ramble at each other about what excites them on any particular day in the hobby. From that Scale Creep was recently born, a pubic outlet for our mutual affliction. Online therapy. Yes. That's a giant floating ballbag there at the back. One of the most enjoyable things, hobby-wise has been the group projects. 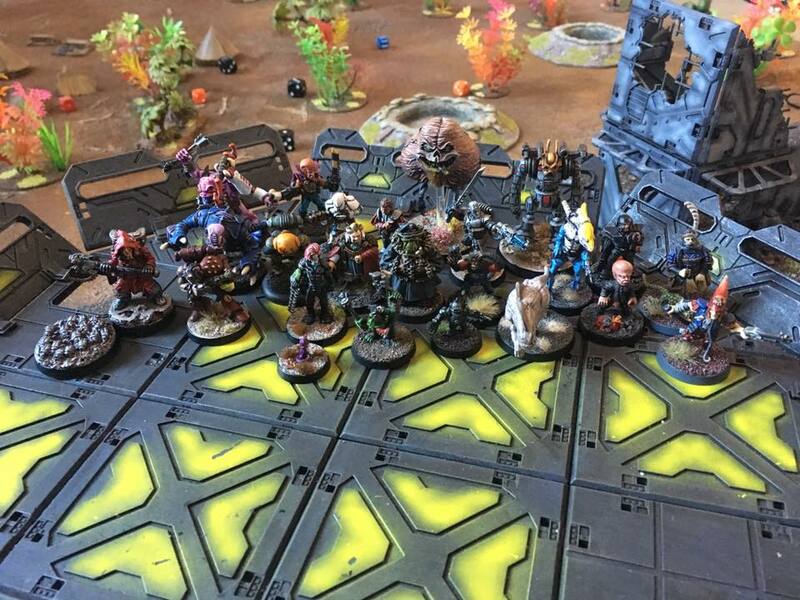 We've had several, and seeing everyone's work moving along has the positive effect of giving painting mojo a serious boost. Added to that the large amount of great work that comes out of the group keeps everyone pretty enthusiastic and churning out even more good stuff. See what I mean about gold in them thar internets? Sneaking. It's what they do. After a while, when you're speaking to folks on a daily basis you can't help but get to know them despite your best efforts. That eventually resulted in almost all of the Wipsters/Creeps showed up at KnaveCon 7. Getting nearly everyone together was tremendous in itself , and as expected, the games themselves were casual, friendly and full of laughs. It's always slightly weird meeting someone you know reasonably well for the first time, but a couple of the aforementioned bearhugs sorted that out. The day went off super well, bar poor JB who was afflicted with something akin to the black death. The amount of fantastic terrain and models was such that I didn't get around to seeing all I wanted to see, but there's always next time. Again, it's one thing looking at a model on the web, quite another holding it in your hand and being able to turn it about for a good look. Brewhouse Bash at full tilt. So there you go. The internet. Not all weirdos and creepy bearded men. 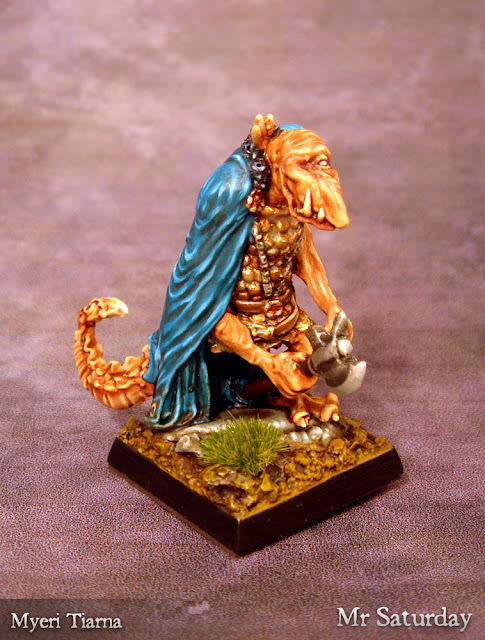 Sometimes it's weirdos and creepy bearded men with great paint skills who like to roll dice and have a laugh. I recently finished this mini for a Rogue Trader game at KnaveCon 7. 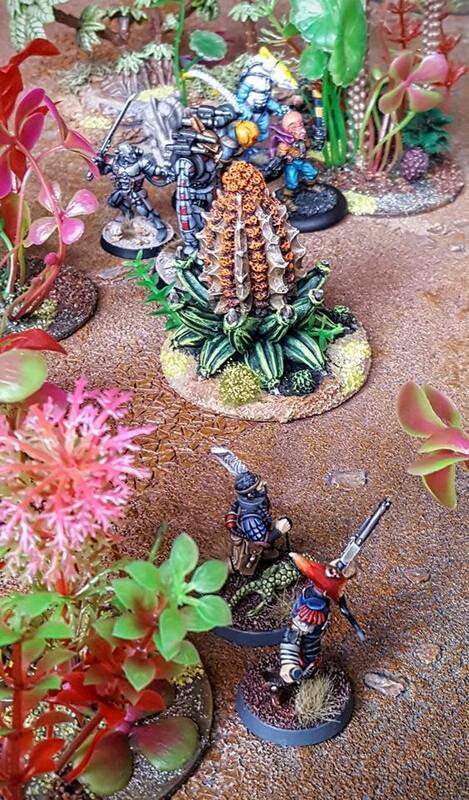 Myself and some pals have been running a Rogue Trader roleplaying campaign over Facebook for several months, and the climax of chapter one became the game on the day. It was very cinematic having characters you were very familiar with race through the jungle to get to the landing pad before the giant floating sac of evil escaped. 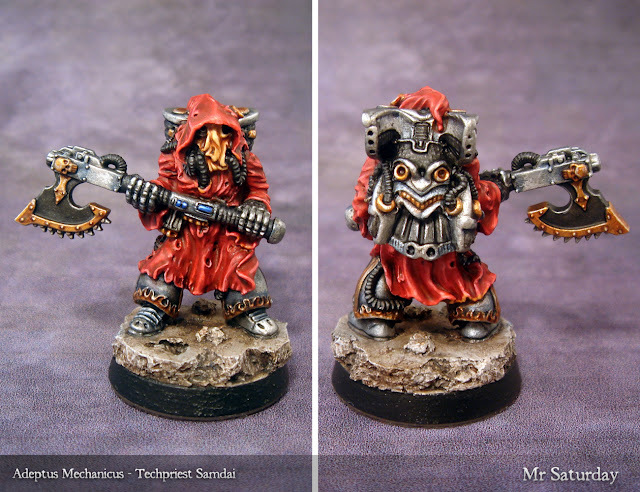 Samdai here is a tech priest, though is currently on the run from the Adeptus Mechanicus due to some mystery as to his origins. He's from Bob Olley's magnificent set of Adeptus Mechanicus models. While I love that whole set, this guy is hands down my favourite Ad Mech model of all time. This particular mini was in a bad state when I got him. 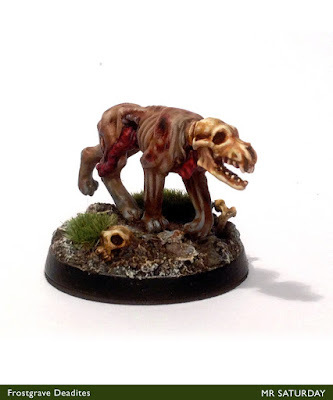 Missing his axe head, scored and flattened in several places, he needed a lot of love to nurse him back to health, before even a drop of paint hit him. I love restoring mistreated minis though, so it was no chore. 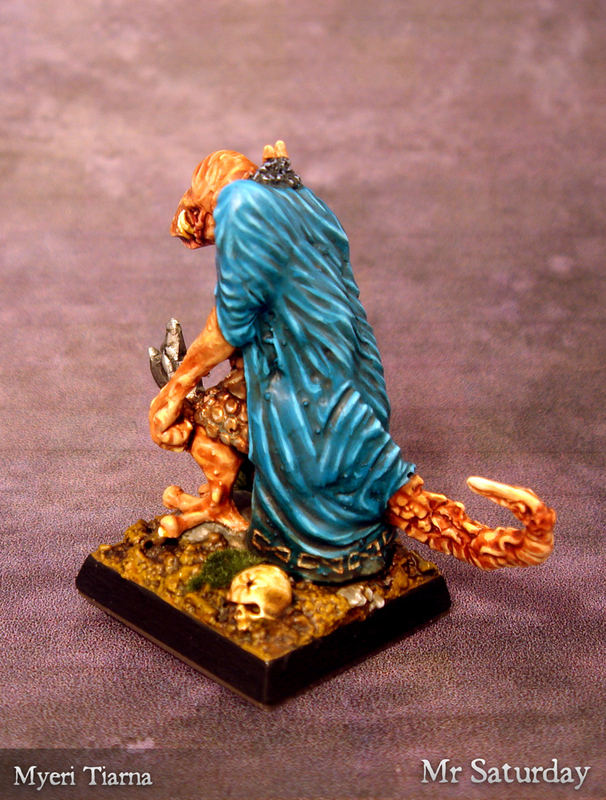 As with many models, I was unaware of the detail on the back, so his ornate backpack was a nice surprise. It's a great shape with it's tubes, exhausts and little 'wings' on the sides. I plan to add to Samdai's retinue in time with some more Olley Ad Mech, some servitors and maybe a skitarii or two. 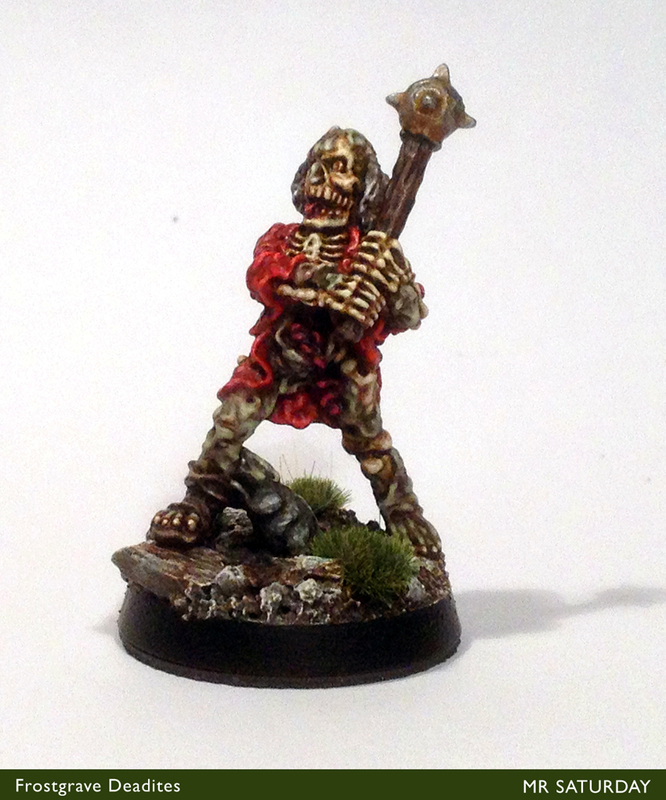 I've not been on the blogosphere too much lately, but now I'm back with a finished Frostgrave warband. 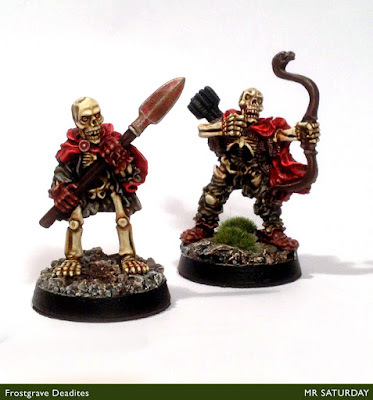 My deadites are done and have seen battle in several games already. I'll be posting on the huge Frostgrave day we had at KnaveCon 7 soon. The warband still needs a few new additions, a second crossbow, bard, templar and maybe an apothecary, but for now, all done. The last two additions were a javelineer and an archer. Meet Otto Spade and Godfrey Blackshaft. I dearly love these guys, they look like guys in rubber suits, which suits the Evil Dead vibe perfectly. The are a treat to paint too, if you don't mind all the texture. Which I don't. Oddly, even though Otto's javelin only has a 10" range, he's my best performing ranged attacker. 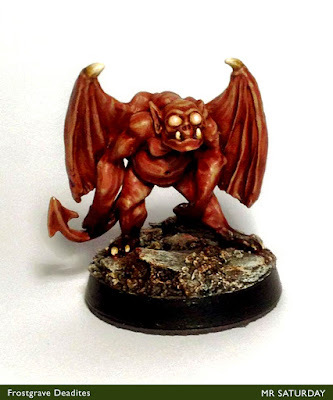 Here are some of the other members I've painted lately but not posted up. I've completed three treasure tokens, also Olley sculpts, the glitter trick worked great on these. I have another five tokens primed and ready for paint. I'm going to paint these nex,t as if I leave them, they'll be hanging out on the shelf of primed for God knows how long. So, once the tokens are done I'll be looking to my next project, It's going to be for Dragon Rampant. The plan is a Big Trouble in Little China force, showing LoPan in ancient times when he commanded an army. Stolen terracotta warriors, hopping vampires, jade mummies, floating guardians and more besides.